Quick Pork Ragu (serves 6 with Pasta) | Crappy Kitchen - Good Dinners! ← Mother’s Day In New York City With My Two Lovely Children! Okay, this is a crazy weekend with far too many things on my plate to wax on about how great this easy-peasy (lemon-squeezy!) pork dish tasted. As is pretty obvious I love to cook, but sometimes the pressure of time makes it an activity that is squeezed in between all the other things that are part of my life. The same goes for the writing. I have only time enough to give the recipe before zooming off to do the million things that very inconveniently came crashing down on me all at one time! I don’t like when my weekend is taken up with things that are not so important to me but still need to be done. On the bright side, if you only came to my blog for a recipe then it will be convenient as you to not have to scroll through a lots of extra stuff to get to it! This is a great dish if you too find yourself short on time this weekend. You can also double up and feed a crowd! 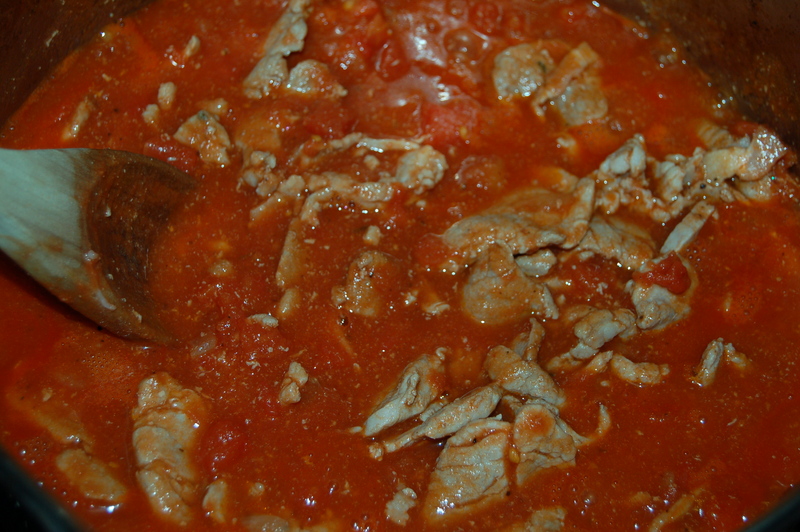 1 – Put sauce pot or deep saute pan on medium heat and add oil. When it warms add the onions and cook for 2 minutes before adding the chopped bacon. Cook for 8 minutes, stirring occasionally before adding the rosemary. Cook for another minute. 2 – Season the pork with the sea-salt and pepper and turn up heat. 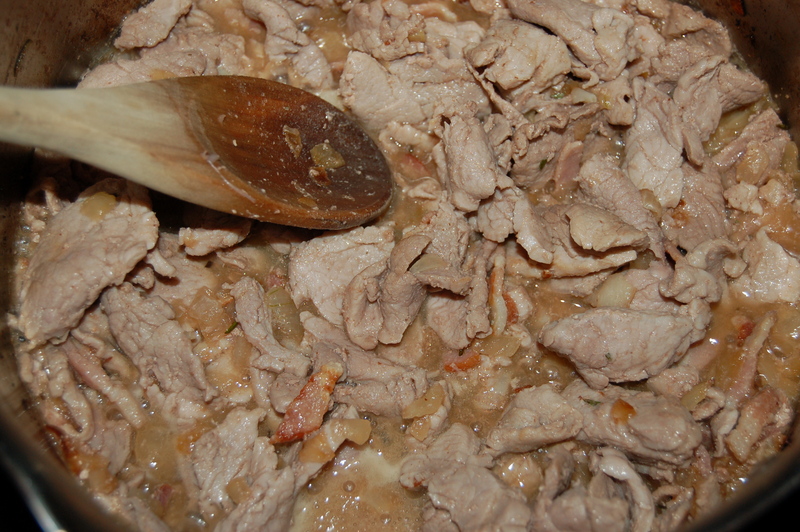 Add the pork and cook for 5 minutes until it takes on a light brown color. Add the wine and turn the heat up to high. Let it bubble for about 1 minute. 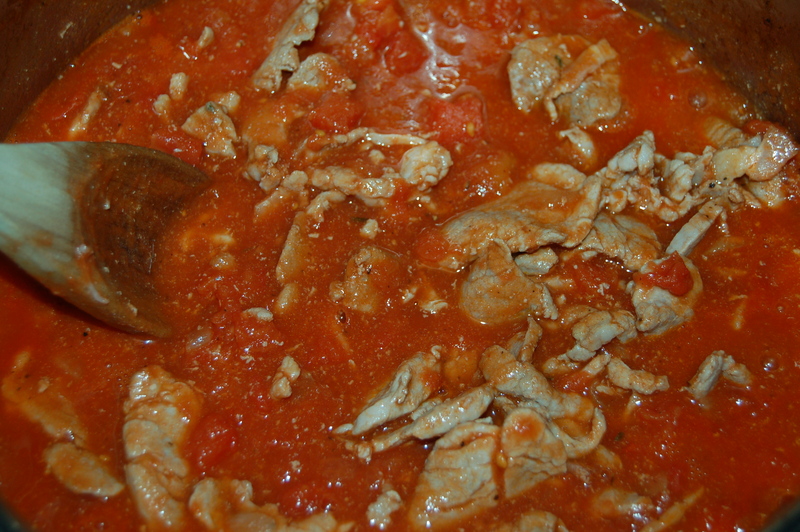 3 – Add the tomato puree, paste, and chili flakes and bring to a boil. Turn heat down, cover and simmer gently for 30 minutes. Taste and adjust seasoning if necessary. Serve with spaghetti, ridged penne or pasta shells. A salad on the side would also be a nice addition. This entry was posted in dinners and tagged bacon, bacon ragu, canned tomatoes, easy dinner, pasta, penne, pork, pork tenderloin, quick ragu, quick-cooking ragu, ragu, sliced pork tenderloin, tomato sauce, weekend dinner. Bookmark the permalink.